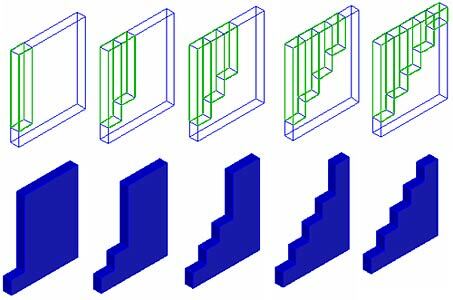 How is a stepped wall created with openings (holes) or using 3D solids? 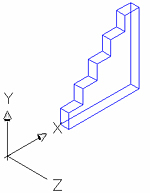 The holes method and the 3D solids method are two other methods to create stepped walls. To create a stepped wall using the method with holes, create different adjacent openings in the cut side of the wall. For this example we will create a wall with a height of 3m, a length of 2.5m and a 30 cm thickness. The first hole is created using the "Create a wall hole in the wall" option on the Advance Model toolbar. 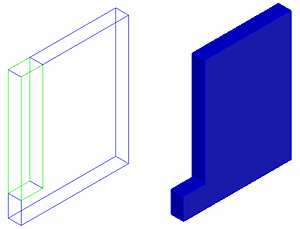 The hole dimensions (R50x250) and the height of the sill (Hsill = 50 cm) are chosen from the properties window. The dimensions are set as follows: the step width of the wall is 50 cm, the height cut of the wall is 250 cm, and the height of the sill is 50 cm. Also the hole crosses through the wall thickness. To create the second step of the wall, create a new hole or copy the first one and assign it the desired dimensions (R50x200cm and Hsil=100cm). After the holes are added the stepped wall can be seen (viewed). Another simple method to obtain the stepped wall is to create this wall using the AutoCAD solid and then transform the entity into a structural concrete element. The "Front view" is chosen from the AutoCAD toolbar. Draw a polyline on the contour of the wall. 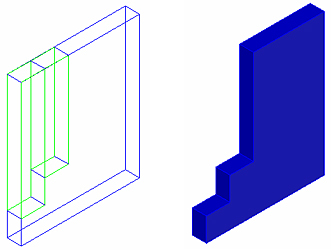 Choose the isometric view from the AutoCAD toolbar, and then use the "Extrude" option on the z direction. When the "extrude" command is used the thickness of the wall is defined. The polyline is transformed into an AutoCAD 3D solid . From the Advance Model toolbar, the "3D ACIS solids to structural" option is used to transform the 3D solid into an Advance Concrete element. The 3D solid was transformed into an Advance Concrete structural element. This method can be used for other shapes used in the modeling of the reinforced concrete structure. Any of these simple methods can be used to achieve the stepped wall.